Summer has arrived and with it, lots and lots of aqua. We saw an increase from 11,000 CFS to 16,500 in a matter of a couple of days. As you could guess this created some chocolate milk flavored water to pour into the Missouri via its tributaries, particularly the Dearborn, which was throwing in a record breaking 10,000 CFS a few days ago. Caddis are beginning to hatch more frequent, though we aren’t seeing much surface action as we would like to. Caddis imitations such as the Tungsten Dart or Czech Cased Caddis are working as well but mostly on the lower section of the river near the banks. If caddis are on the surface look for fish sipping in the slow water and eddies near the bank. These fish can be picky so make sure you fish a long leader and do NOT put your line over them. My favorite fly for the big sippers have been the double duck caddis or the corn-fed caddis. Remember, these fish have a long time to inspect your fly before eating it! Streamers could be a good option for these wet and cloudy days. We are throwing an olive & white Docs Articulator, Coffees Sparkle Minnow, or a Kreelex. Black is always a good choice if they aren’t diggin’ the flash. 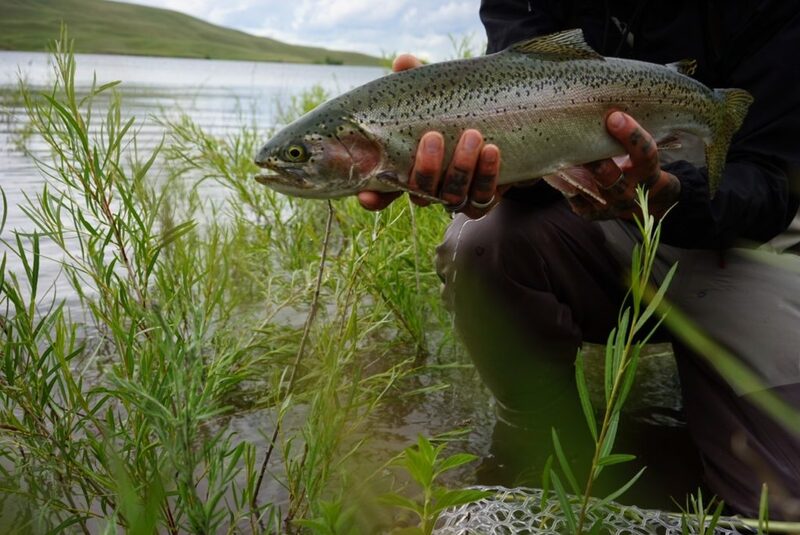 Don’t forget to check out some of the lakes in the area, which provide excellent stillwater fly fishing. We are expecting to continue seeing pretty wet weather on and off for the next week or so so make sure you bring all your rain gear, as well as some extra dry clothes for after. Stop by the shop for some hot coffee and some advice before heading out.